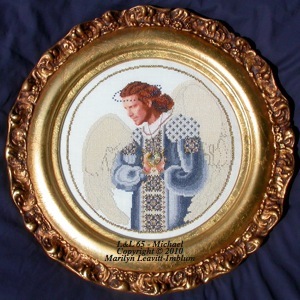 For years stitchers have asked, begged, and pleaded for a male angel to go with all of the female angels. I have tried and the faces would not look good enough. They looked fierce or too flamboyant or too much like warriors carrying swords or battle armaments. None were gentle yet strong. I wanted a protector of children .... a kind angel of strength ... a leader within the stars. I think I finally got it right! I hope he fulfills your dreams of what a male angel looks like. Stitched 2 over 2 on 32 count Belfast linen Miracle Mint (#3609/615/55) from Zweigart. Frame number 454 from InLine Ovals. Copyright © 2010 Marilyn Leavitt-Imblum. All rights reserved.